Anything can escalate, and when it does it’s often referred to as being party to the snowball effect. The snowball starts as a small thing, but as it rolls it gets bigger and it gains more and more momentum. Where it stops is anyone’s guess. I once wrote in to the letters page of the long since defunct football magazine; 90 Minutes. I forget what the letter was all about now, but I know I was responding to something someone else wrote. I’d class it as a ‘fit of pique’. It was something I’d never done before and it wasn’t something I was intending to do again. To my surprise, this letter was published and to even further surprise Alan, a mate of mine, happened to pick up a copy of 90 Minutes that particular week and he spotted my letter. He made mention of it and then suggested I should write something for a new Liverpool fanzine he’d managed to get involved with. I laughed, I shrugged off the ludicrous idea of it, then I let it play on my mind a bit. I allowed it to nag away at me throughout the summer and then I sat down and wrote an article, the first article I’d ever written. I wrote an article with ink and paper. I folded it up, I placed it in an envelope, along with a cover letter which didn’t include a return address, thus eliminating the concept of a rejection letter dropping through my letterbox. I walked to the post-box, I took a deep breath, I winced, then I dropped the sealed and stamped envelope into the rectangular gap. It had gone. To my surprise, this article was published. My relationship with Red All Over The Land has since stretched to close on two decades. During that time other writing opportunities have stumbled across my path. An accidental snowball effect which means there is a book on my book shelf which I can pick out, flick through, and then stop at the chapter I wrote for it. I’ve fluked a handful of articles onto Guardian Sport and written for a website by the name of These Football Times; which is about to launch into a glossy print version. I’ve written for the ‘holy trinity’ of internet born Liverpool FC entities; This Is Anfield, Anfield Index and The Anfield Wrap. I’ve been roped into podcasts along the way. Being able to write a piece and see it published on the internet a couple of hours later is a remarkable thing. I wouldn’t have launched my own website if I thought otherwise. Seeing an ex-Liverpool player or a writer you like retweet something you’ve written is pretty cool to be honest. There are drawbacks to go with the advantages too however. Immediate, and often critical feedback via the comments sections of these websites is something you never really get used to. A computer monitor is also no substitute for seeing your name in actual print. None of this would have happened without Red All Over The Land and their enigmatically grumpy editor John Pearman being there first however. Neither am I unique. Many of us have come from a fanzine background. Fanzines are an increasingly endangered species however. As Liverpool’s match-going support, and football in general continues to evolve, much of the staples of the era they succeed struggle to keep up. Fanzines represent a link to the old-world, and it is link to something we need to hold on to. My local library is about to close down. The victim of funding cuts. I see a similarity in the difficulties facing not just fanzines, but all printed produce. Why buy something which can be ‘out of date’ when you can log-on to any number of online venues for free and read up-to-date items? That is one battle the printed publication can’t win. Fanzine editors learned to be clever though. Contributors given projected release dates so they could create something topical and relevant by the time it reaches the streets. It has still been akin to swimming against a powerful tide. Steven Kelly saw what was on the horizon and pulled the plug on Through The Wind And Rain long before the full-on fanzine recession took hold. Dave Usher admirably hung on with The Liverpool Way so as to complete 100 issues. TLW happily still exists in website form and is another outlet I’ve been lucky enough to write for. Neil Poole, around two and a half years ago went the opposite way. He tried to fly the fanzine kite in the eye of the destructive hurricane, when he launched We Are Liverpool. This is what he has to say on the ups and downs of running a fanzine during an electronic era. Is there a certain ‘type’ of fanzine buyer? The demographic of fanzine buyers definitely leans towards the older Liverpool fan in my experience, say 35+. Interestingly (I think) the fact that WAL lasted as long as it managed at all, which admittedly wasn’t long, was because of the Liverpool Echo in my view. On the day of the very first issue James Pearce kindly put a little piece about it in his Blood Red column in the Echo. A lot of people who bought it that day mentioned they saw it in that column. From that point onwards my main ‘customer-base’ were the people who bought that very first issue. I picked up very few ‘new’ readers in 18 months and obviously WAL had no loyal readership to rely on in the same way RAOTL does or TLW did because it was brand new. The plus side is that the experience of selling was great because you had regulars you could rely on, get to know and have a good chat with. In regards to that Echo plug, essentially, people who buy a hard copy of the Echo are primed to buy a hard copy of a fanzine. In turn those people tend to be older. And those who would never dream of buying a paper like the Echo are probably never going to buy a fanzine, on the whole. They tend to be younger but also lots of people have also just changed habit. I don’t buy newspapers anymore for example. A lot of online Liverpool ‘fan media’ tried to help out, from This is Anfield, Anfield Index, lots of people on Twitter and later on it would get a plug from The Anfield Wrap on their City Show. That was all appreciated and the intentions were good but it never made an impact on sales. And it’s clear that the audience for online LFC material and podcasts is not the same audiences as those who buy fanzines. Again, this is in general terms there will obviously be exceptions. One other thing I often noticed is that people who bought WAL always bought a copy of RAOTL and TLW too. There’s definitely a group of people vested in fanzine culture. Unfortunately, that number is dwindling. For many who do buy them there definitely seems to be a ‘collector’ trait amongst them, which is great because it reminds me of people who spend hours in record shops or comic shops. I can relate to those people. Do you think anyone would be brave enough to start off a print fanzine again? I don’t think you need to be brave because the risks of giving it a go are minimal. As long as you don’t go and get 10,000 copies printed and think you’ll sell them you’ll be fine. I never made a loss because I printed the right number. After about the third issue I’d covered my initial outlay and from that point it sustained itself, with the profits for one paying for the print-run of the next issue with a little bit left over (not much though!) each time. The soul destroying thing however, is knowing that the quality of it makes no impact on the number of readers. I’m of the opinion that WAL was great and on the whole, as a collection of Liverpool writing surpassed what you would find on the majority of online sites. However, ultimately that doesn’t matter if no one reads it in the first place. The only way I think a fanzine can survive now is by being old enough that it has retained a good number of regular buyers or if someone finds the magic pill which will make a whole generation of people who ‘consume’ Liverpool online and via podcasts also buy extended, hard copy material. I don’t think it’s just a case of people not wanting hard copy, I also think there isn’t much appetite for reading long form or extended writing or a collection of writing, because no e-mags that I know of have done particularly well either. So it’s not as simple as the writing not being online. It’s more to do with people wanting things bitesize and only really being interested in immediacy rather than reflective writing. Which is fair enough. I’m not going to begrudge people what and how they want to read. I genuinely do think lots are missing out on the unique make-up of fanzines though. One final thing I would say is that in all my experiences since I started blogging, although the help from online sites has been great, I think the relationship with John and Dave was quite unique. There was never any sense of competition and they both bent over backwards to help me out. The reality is that to different degrees we were all up against it and finding it difficult, so there was a sense of being up against it together rather than against each other. John and Dave did it far longer than me, but there is something in the shared soul destroying experience of standing in the rain trying to sell something you think is great, while people ignore you! God, it almost makes me want to start again! The striking thing about Neil’s therapy session here is that it attains an identical tone to conversations I’ve had with John Pearman and Dave Usher in recent times. It is a tone which is born of a resigned militancy. 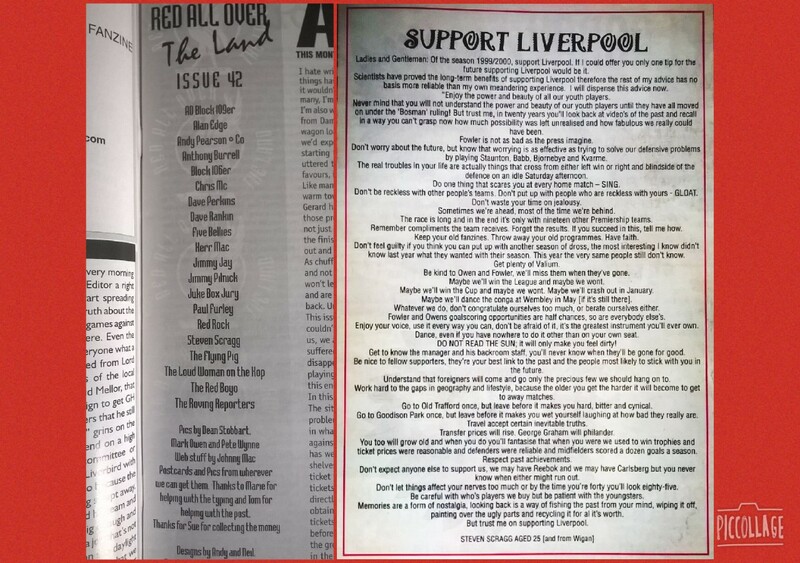 Red All Over The Land is the last remaining Liverpool fanzine. 21 years old, 225 issues and counting. It too was on the critical list not all that long ago, and how long it will continue the fight against the ever changing match-going landscape is open to question. Like that library you walk past on a regular basis, without ever going in, stop and pick up an old-style printed publication when you drift past the small number of sellers dotted around Anfield on match-days, because they might not be there one day. You’ll miss them once they’ve gone.